7 Year Diaversary-Celebrate or Ignore? The Diaversary, it’s the anniversary of Joey’s type 1 diabetes diagnosis. To celebrate or let it pass without acknowledging it- that’s the question! You know when you have a life altering event happen in your life it’s hard to ignore its anniversary each year. But yet it’s an event that wasn’t a happy one, so you wish you could forget it, or at least ignore it. For me it’ll forever change the way I feel about Mother’s Day! What’s suppose to be a happy, relaxing day for Mom turned upside down 7 years ago and changed our lives forever. It’s like someone dying on your birthday, you can’t NOT think about it. Joey actually mentioned that his Diaversary is coming up. Surprised me when he said it. I didn’t realize that he was thinking about it, now or ever! Sometimes I wonder what else he thinks about-diabetes related anyway. I know he thinks that if there was a Zombie Apocalypse that he wouldn’t last long! He said it one day. He said “I’d be the first to go!” That KILLED me! I think he’s watching to much Walking Dead, in fact they had a person with type 1 diabetes portrayed on the show! They were eaten by a Walker-didn’t die from lack of insulin. Was happy about that! I know-morbid! Made me think. A Zombie Apocalypse – a nuclear threat from North Korea. Insulin can’t be hoarded, wish it could! Can only get three months at a time according to insurance. We have enough Lancets to last a lifetime, but you don’t need a script for those. Enough of that kind of downer talk! But it does make you think about what would happen in a national disaster, and it reminded me that he thinks about it-not often I pray! 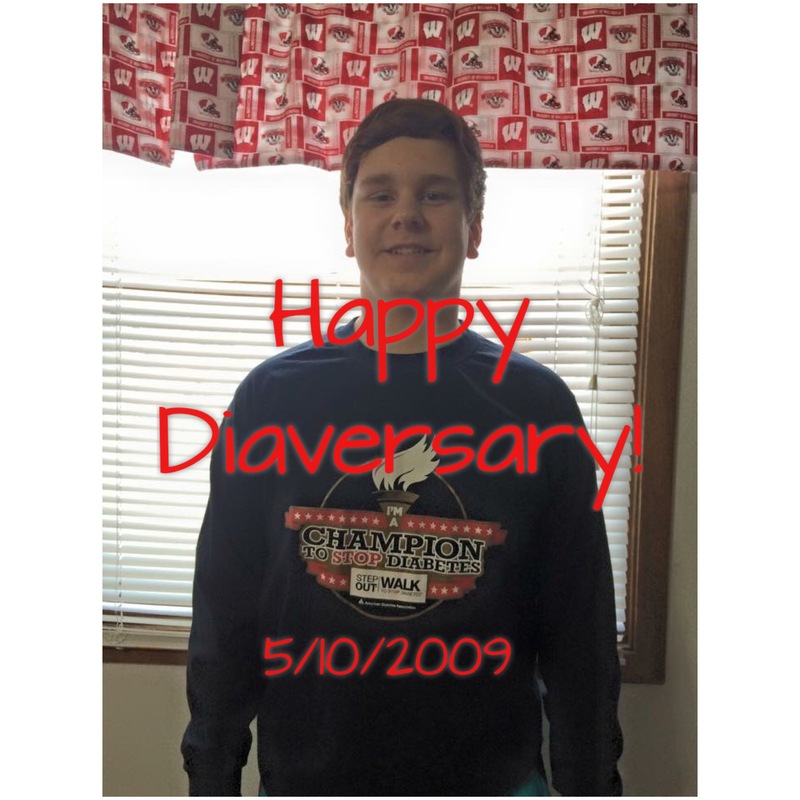 The positive thing about celebrating his Diaversary is looking how far we’ve come, recognizing that he has done so many great things for the type 1 diabetes community! In the 7 years since he was diagnosed we have been blessed to raise and donate over $40,000 to diabetes research. As the Ambassador for the American Diabetes Association, Joey was interviewed and appeared on multiple newscasts, spoke to literally hundreds of people including lawmakers, kids, adults, heads of Endocrine departments! He was in Diabetes Forecast Magazine, on ESPN.com, the list goes on! Education is key to early detection! He’s also proven to himself and other kids with type 1 that you can be successful in sports, in school, and in life! Don’t ever let it stop you from following your dreams! Don’t be embarrassed and don’t hide it from your friends! You may need them to help you one day. That was Joey’s platform. So, should we celebrate his Diaversary or let it pass? We’ll celebrate! We’ll celebrate his life! Previous Post What are your kids afraid of?